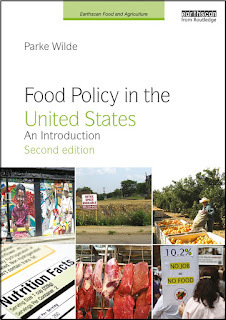 In my in-box are two new books on agricultural policy controversies, both written by agricultural economists. Both books seek, with partial but not complete success, to move beyond a certain fear of criticism, openly engaging readers who may have diverse public interest concerns and motivations. When criticized on environmental or nutritional grounds, U.S. farm groups sometimes are tempted to adopt a thickly-armored defensive posture. 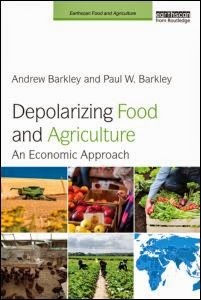 In this daring book, respected agricultural economists Andrew Barkley and Paul Barkley offer a persuasive alternative. Echoing Schmpeter's vision of creative destruction (naturally), but also drawing on John Stuart Mill and Nelson Mandela (more surprisingly), the authors argue for an open and understanding approach to contemporary food and agriculture controversies, eventually offering hope -- as the title indicates -- for depolarizing food and agriculture. Rather than striking a defensive or muckraking tone, as so often is the case in this genre of writing, Norwood and colleagues embrace the controversies, interpreting them as a sign of a healthy democracy struggling to deal with pressing challenges. They reveal what the best science has to say on topics ranging from food pesticides and GMOs to the carbon footprint of beef production and the well-being of farm animals. They weigh in on synthetic fertilizers, local foods, and farm policy. Theirs is a respectful discussion of the positions taken up by different advocacy groups, but there is no hesitation in drawing conclusions where logic and science warrant. To understand food policy in the United States, one must pay attention to Mexican and Central American farmworkers in this country, but also to farm labor in Mexico. The Los Angeles Times today has started an article series and a remarkable video series on the Mexican workers who produce in Mexico for export to the United States. The tomatoes, peppers and cucumbers arrive year-round by the ton, with peel-off stickers proclaiming "Product of Mexico." Farm exports to the U.S. from Mexico have tripled to $7.6 billion in the last decade, enriching agribusinesses, distributors and retailers. One future contributor to a more just food system could be policies that U.S. importers and supermarkets may adopt, stipulating standards for farm labor in the upstream supply chain. To some extent, such policies are being developed. The LA Times article reminds us that these policies are not yet working smoothly. Another contributor to a more just food system could be changes in the supply and demand for farm labor, leading to higher wages and better working conditions. It is important to pay attention to these fundamental economics, and not just to labor standards that supermarkets promise to adopt. 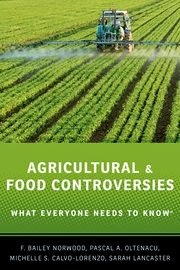 Two of the best agricultural economists covering this issue are Philip Martin and J. Edward Taylor. Their 2013 report, titled "Ripe with Change" (.pdf), summarizes (in somewhat blander language!) many of the same terrible conditions that the LA Times article reported, while also reporting some promising trends in tighter labor markets for Mexican farm workers. In particular, demand for agricultural production has been increasing across North America, while simultaneously employment demand in other Mexican industries has expanded. An essential question is whether Mexican workers will reap the benefits, or instead whether small increases in wages will provoke large increases in mechanization, leaving workers little better off than before. 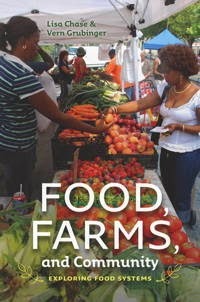 I am enjoying reading the new book-length coverage of local food systems in Food, Farms, and Community, by Lisa Chase and Vern Grubinger of the University of Vermont. Food, Farms, and Community: Exploring Food Systems takes an in-depth look at critical issues, successful programs, and challenges for improving food systems spanning a few miles to a few thousand miles. Case studies that delve into the values that drive farmers, food advocates, and food entrepreneurs are interwoven with analysis supported by the latest research. Examples of entrepreneurial farms and organizations working together to build sustainable food systems are relevant to the entire country—and reveal results that are about much more than fresh food. Chase is a natural resources specialist at the UVM and director of the Vermont Tourism Research Center (and a long-time friend and classmate from graduate studies at Cornell in the 1990s). Grubinger is an agriculture specialist with UVM extension. Tufts biology professor Benjamin Wolfe will speak about "The Secret Life of Cheese" tomorrow at the Friedman School's Wednesday seminar. Benjamin Wolfe and Rachel Dutton ... recently brought 137 cheeses from 10 countries into Dutton’s lab at Harvard University for genetic analysis. 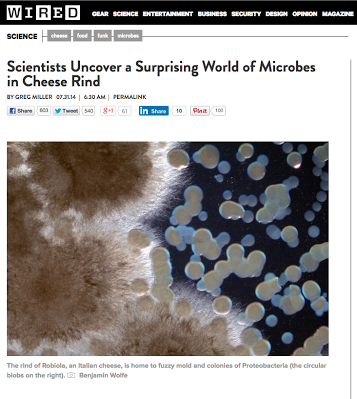 In a paper published July 17 in Cell, they and colleagues describe their findings, which include a few surprises—like the presence of bacteria commonly found in marine environments on cheeses made nowhere near an ocean. As a sometime amateur cheese maker with very mixed success, I'm looking forward to learning from this talk.